Where in the USA is the Foodie Family? We’ve been suffering with the heat and humidity here in the Northeast. Not that we should whine (too much), after all, we did want summer after that prolonged cold winter. But, enough with the steambath! Anyway, cooking needs to be simple and quick in this weather. I don’t know about you, but there are just so many cold salads I can eat before I want something different. Yet the thought of standing over a hot stove or heating up the house by turning on the oven is more than I can bear. “Grill”, you say? No. It is 95 degrees out there and I don’t have time to hydrate before tending a grill. Then, I had that “aha!” moment. 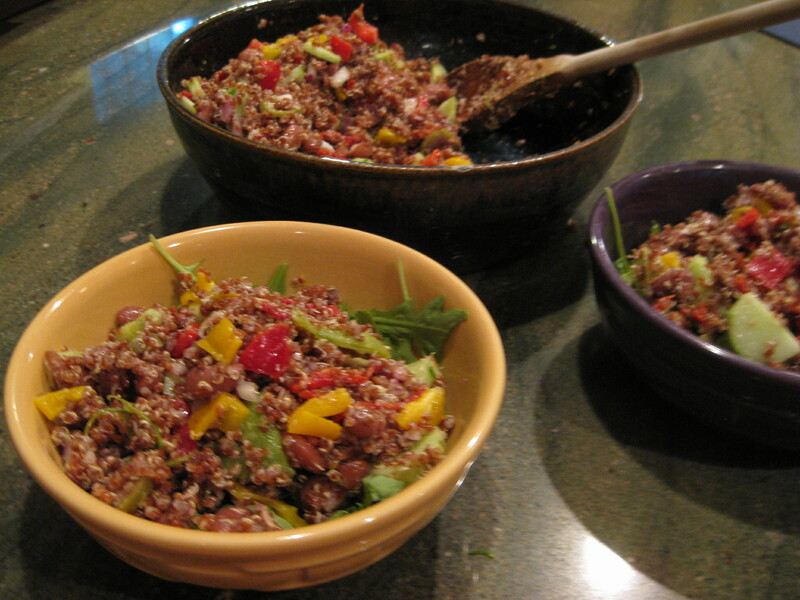 Whole grain salad. I can cook up the grain with little attention from me – just shove it on the stovetop and walk away. 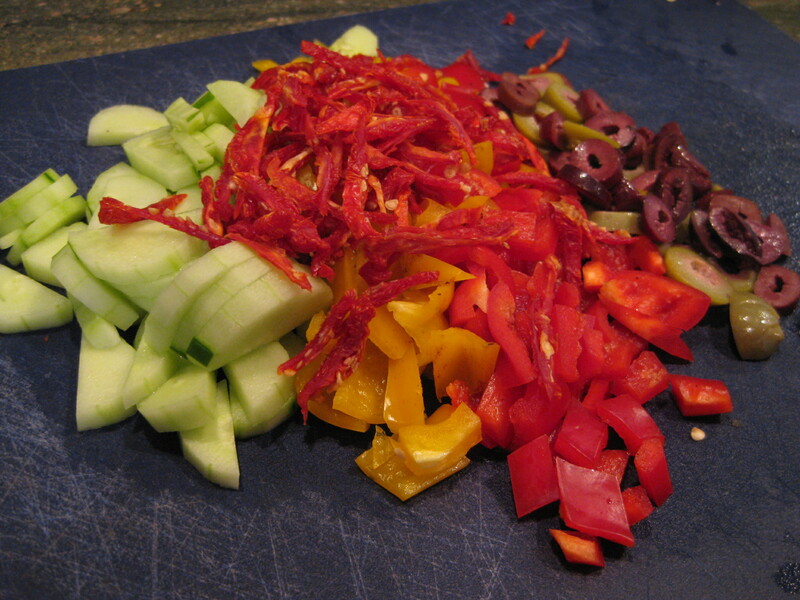 And I felt up to the task of chopping some fresh vegetables. I was especially eyeing the cucumber that Jim picked this morning. So, I rummaged around in the fridge and came up with this tasty alternative to traditional green salad. 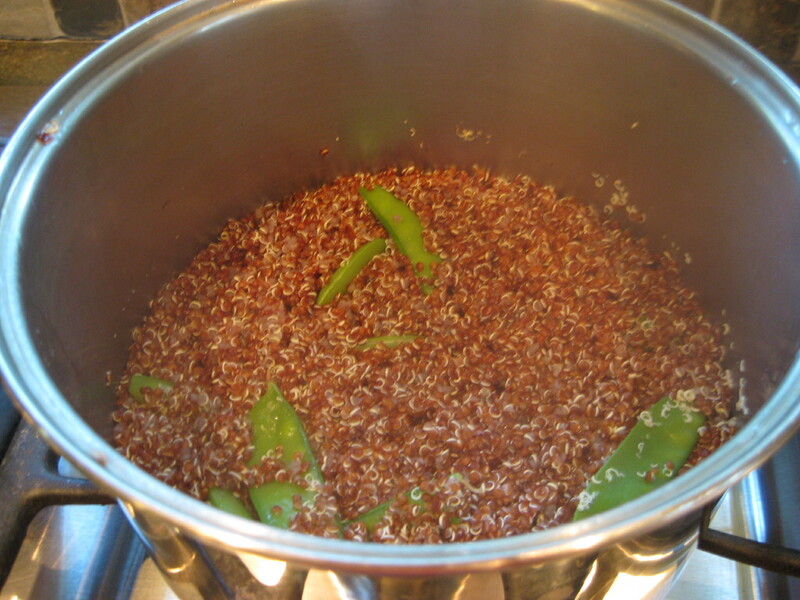 First, if you plan ahead and soak the quinoa, great! My niece is a proponent of this and I do think the grain is softer when soaked beforehand. However, I don’t always plan ahead. This time, I managed to remember and soaked it for a few hours. And because I wasn’t interested in being near the heat, I threw the sugar snap peas into the pot with the quinoa. Normally, I may use them raw but these were old, late season peas and not particularly tender or sweet. But hey! I grew them myself and I am using them! I think the colors of the peppers are beautiful! After the quinoa is finished cooking, I fluff it and let it sit with the lid off the pot until it has cooled because I don’t want the hot quinoa to soften my fresh vegetables. Once it has cooled, I toss everything together! I like arugula so much, I put some in the bowls before the quinoa salad. I don’t put it in the whole thing because if I have leftovers (and with only two of us, there are plenty with this recipe), the arugula will get smooshy. I hope you enjoy this high protein summer salad! It really hit the balance point between easy, fresh and comfort food for us! Ani – that looks delicious! What a great idea! 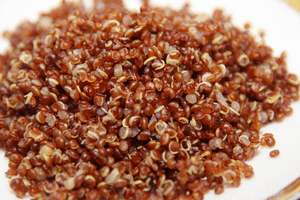 I really love quinoa and am finding it to be quite versatile.